Top model Tweetie de Leon-Gonzales was packing for an out-of-town trip last week when she chanced upon a pair of shoes created by the late fashion pioneer Cesar Gaupo in the closet. She picked up the pair “which I haven’t worn in over five years, I think. I don’t know what made me decide (to bring) it” while organizing her wardrobe for a wedding set in Bacolod. What was clear that time was that De Leon-Gonzales would miss Gaupo’s 72nd birthday party Friday night. Little did the model-turned-entrepreneur know that while she celebrated with the newly-weds several islands away, Gaupo would go to bed after a joyful night of laughter and nostalgia with close friends and never wake up again. Gaupo died peacefully in his sleep on the morning of Jan. 19. It was a Saturday. The news rocked the country’s fashion industry and sent scores of creatives that Gaupo taught or touched sobbing on their work tables after learning of his death. Accolades poured as funeral arrangements were still being made. Ivar Aseron noted how people “told us we looked alike.” Aseron, out of respect, wanted to call Gaupo “Nanay but he always insisted we were sisters (instead).” Gaupo’s generosity also struck Aseron who recalled receiving clients that Gaupo could no longer accommodate. The late designer’s sunny disposition would definitely be missed. Many who were struck by the loss offered a recollection of Gaupo’s jolly laughter. “The times I spent with him were 20 percent wisdom and 80 percent silliness. He just liked to laugh. And he laughed with so much gusto. He couldn’t care less,” designer James Reyes said. “He was funny, silly, and a maldita and that’s what made me love him even more,” he added. 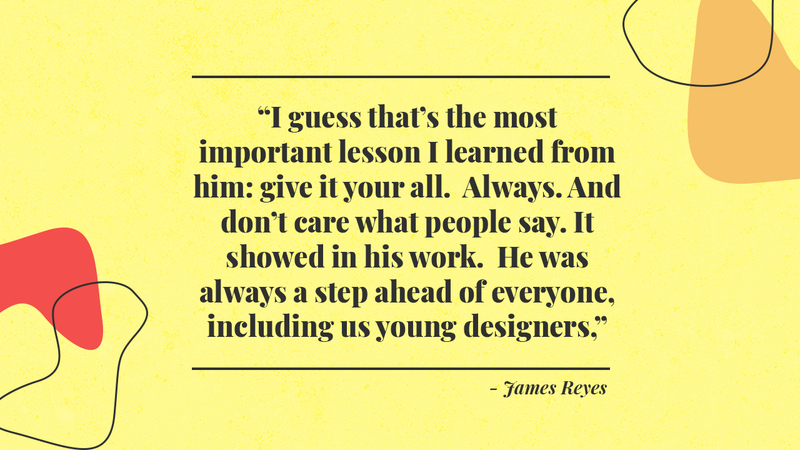 Designer James Reyes offered a similar story about Gaupo’s respect for another’s path, search or innovative tendency. “When everyone was going this way, he was going the other way. He created clothes you haven’t seen before…I guess that’s the most important lesson I learned from him: give it your all. Always. And don’t care what people say. It showed in his work. He was always a step ahead of everyone, including us young designers,” he observed. That he thought differently also called attention. Fashion show director Robby Carmona remembered a collaboration where Gaupo asked him to help launch the designer’s shoe line. “His vision was solid. No runway. No models walking. He wanted installations where models will showcase the shoes. And this was before presentations became a trend. He was truly ahead of his time,” Carmona said. Milliner and fashion designer Mich Dulce admitted being attracted to Gaupo’s out-of-the-box mindset. “We weren’t close but I remember when I was young and starting as a designer, I would save up for his pieces because he was kind of the only one who worked with geometrical shapes and drapes and I really admired that,” she said. Tan Gan and Gaupo were among the up-and-coming designers offered to develop their own brand by SM several decades back. Gaupo’s success made him a “trusted” team member of the Sy family, “particularly Tessie Sy-Coson” and went on to create made-to-order cocktail wear, evening wear and wedding gowns, the Lifestyle story said. Friends and colleagues remain in awe until now of Gaupo’s stint in Shanghai Tang, the Hong Kong based fashion and lifestyle designer house, where he worked as head of the creative design team for several years beginning 2000. Gaupo’s renegade streak was apparently a major reason for attracting the global design house’s attention. The years-long experience eventually inspired Gaupo to return home and explore home and lifestyle design as well. Dubai-based Michael Cinco said Gaupo’s “beautiful house in Laguna” amply reflected this career turn. That Gaupo remained “very humble and simple” was a plus for “one of the best Filipino designers who really made Filipinos proud (especially) when he became the head designer of…Shanghai Tang,” Cinco maintained. Like other fashion insiders, Mananquil-Trillo gushed about Gaupo’s seeming indifference to his status in the local fashion industry. “He never felt more important than anyone else. He entered with presence but with warmth. He was always friendly, accommodating, and endearing. He set the standard on how successful designers should be,” she said. Gaupo’s young-at-heart disposition was also a highlight among those now mourning him. “Out of (the) work (place), he has taught me how to stay ‘bagets’ and have fun,” designer Buendia said. “You are the ‘bagets’ that is truly youthful,” Tan Gan seconded in a statement addressed directly to her friend. Event host Tim Yap recalled Gaupo’s “infectious” energy despite being decades older than some peers. “He was one of the pillars of fashion who showed the younger generation, ‘This is what you can be.’ Creative and happy for others, without any haughtiness or self-aggrandizement,” Yap said. Tan Gan said she has not shed tears “in plenty of years until this day” upon learning of Gaupo’s unexpected passing. De Leon-Gonzales remains “devastated” for not attending Gaupo’s final fete.